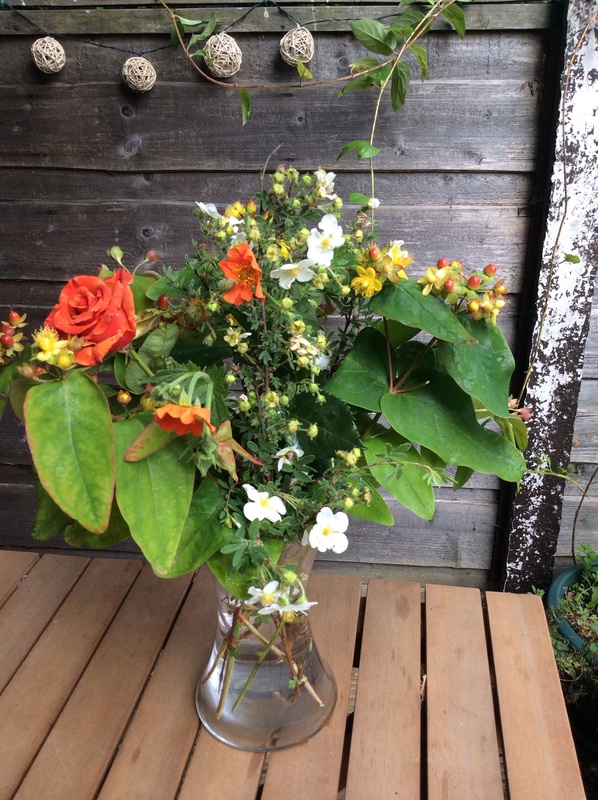 In a vase on Monday – Oranges and lemons – anyone for tennis? As the weather warms up across the UK and the tennis at Wimbledon starts, it’s got me thinking of Robinson’s lemon squash. It’s still a part of the courtside scene, and is integral to the British summer. So today’s vase is reflecting the colours of oranges and lemons; I hope you like it. I’ve been waiting a while to show the only rose I have in my garden. It’s from my front garden and was in a very sorry state when I brought my house 6 years ago but some judicious pruning from my Chap has revived it. I couldn’t include any of the open roses as they’d lost petals because of the winds we had at the weekend. It opens out into much lighter orange petals – no scent though. ‘In a vase on Monday’ is hosted by Cathy over at www.ramblinginthegarden.wordpress.com/ She’s got a really vibrant vase this week with her first sunflower. It’s lovely – do have a look around everyone’s vases – I can’t tell you how much the vases brighten my day. – Geum – Queen of Orange – this is new to the garden this year. I’ve got a red/orange Geum which was planted last year but the flowers went over between Sunday and Monday – typical! -a yellow hypericum – there were six bushes of this around my garden – two in the back garden and four (yes four round the lamppost in my front garden). We’ve dug up, split and given way all but two plants in front garden and one in the back garden. I like hypericum’s as you get a lot of plant, interesting leaves, pretty yellow flowers and then red/black berries right through until Autumn. – Potentilla fruticosa – ‘Abbotswood’ another shrub which was in my garden when I arrived. It’s on the edge of my patio and has a lot of pots sitting in front of it – and the white flowers set off my fuchsias very well. The vase is just a plain glass one with a ‘clinched’ in middle. 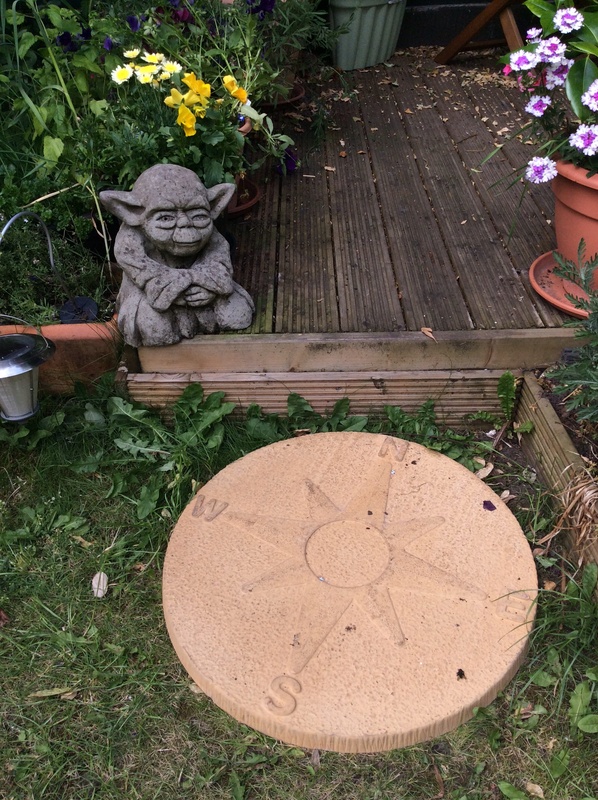 My chap and I had our fifth anniversary last week, and one of the gifts he gave me was this compass paving stone – he knows we plan so many of our adventures while sitting in our garden and it fits perfectly in the gap next to the decking. It’s set to magnetic north and, as usual, yoda is overseeing things. My Chap’s going to set it in gravel soon, as that end of the garden is very shady, so the grass is mostly moss and that’s why there are lots of dandelions too. I’m off to watch a bit more Wimbledon – I’m very happy because the wifi works throughout the garden so I’ll be sitting at the bistro table enjoying the view of the garden too. I’ve always loved watching the tennis. My mum used to listen to it on the radio all day at work and as soon as we got home the TV would be on and we’d all be watching. I was lucky enough to go to Wimbledon with my mum in 1977 – Centre Court tickets too. We saw Ilie Năstase, Billy Jean King and an 18 year old John McEnroe at his first Wimbledon (as an amateur too), he was grumpy but it was very clear he would be a great talent. The strawberries were lovely, but expensive, so nothing much changes. I’d love to go again but always forget to put in for the ballot. 1977 was a fine year as it’s also the being of my love of Star Wars – I think I saw the film three times at the cinema, and everyone wanted a light sabre for Christmas. I was 11. Fingers crossed for Andy Murray. Are you watching the tennis too? 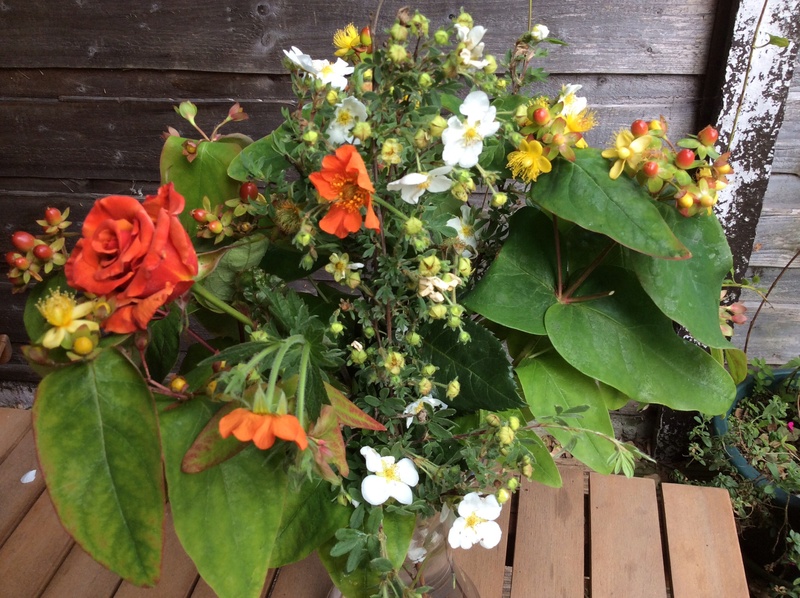 This entry was posted in Gardening, In a vase on Monday and tagged geum, hypericum, In a vase on Monday, Martin Amis, potentilla, rose, tennis, wimbledon, yoda on June 30, 2015 by Bec - views from my garden bench.